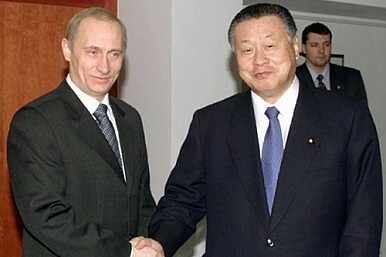 Russian President Vladimir Putin and then Japanese Prime Minister Yoshiro Mori in 2001. Putin’s Tokyo visit isn’t set, yet both sides show a desire to talk despite worsening Ukrainian crisis. Former Japanese Prime Minister Yoshiro Mori has been in Russia this week, and on Wednesday met with President Vladimir Putin. Visiting in his official capacity as head of the organizing committee for the 2020 Summer Olympics, as well as the apparent personal emissary of Prime Minister Shinzo Abe, Mori has managed to make some perhaps ill-considered statements, something he was famous for during his premiership, as well as becoming the first Japanese official to meet with Putin since Moscow annexed Crimea in March. Still, his visit and message underscores Japan’s willingness to press forward with relations despite the deteriorating situation in Ukraine. Once described by his peers during his premiership as having “the heart of a flea and the brain of a shark,” Mori on Tuesday told a meeting in Moscow on Japan-Russia relations that he “feels sad that Putin comes under international criticism over the Ukraine crisis,” according to the Jiji Press. He was last in Russia during the Sochi Winter Olympics, when he also had the opportunity to meet Putin. Mori’s statement will no doubt irk Japan’s European and American allies, especially since he became the personal envoy for a message from Abe to Putin the next day. While he said on Tuesday he had no plans to meet with Putin, just before midnight on Wednesday Mori met the president at the Kremlin and delivered a personal letter from Abe. Speaking with the press shortly afterward, Mori said that Putin read the letter “on the spot” and told him to give Abe his regards. Though the former prime minister was not privy to the letter’s contents, he said “I have a feeling it said we should continue talking.” Mori also said Russia must strive for a peaceful solution to the Ukraine crisis, which Putin said he would do. While the issue of Putin’s possible visit to Japan this fall apparently didn’t come up, the meeting itself displays both sides’ desire to at least keep it on the table. Russia and Japan have two important reasons to talk: the disputed Kuril Islands (or Northern Territories in Japan) and the prospect of a much larger energy relationship. A settlement on either of these issues is not likely to ruffle many feathers in Washington or Brussels if it is kept low key, and especially if it does not affect the ongoing crisis in Ukraine. The U.S. has already stated it does not object to a meeting between Abe and Putin. However, there are limits to what the U.S. and its allies can either accept or ignore. Politically, Japan cannot be seen as sympathetic to Putin, as he is currently the most vilified person in Europe. If it wishes to reach tactical accommodations on regional issues it must do so quietly, remaining in step with its allies in Europe in its condemnation of the crisis in Ukraine and its sanctions on Russia, as symbolic as they may be. However, a large new deal on energy imports would likely cause problems for Japan, especially if it provided meaningful sanctions relief for Russia. Were Putin to visit, a large deal on energy would not be prudent. However, movement on the island dispute would be a way of both sides showing they are committed to not just a holding pattern, but keeping high level lines of communication open, while not drawing too much negative international attention. Even if the visit does not happen, both Japan and Russia have been willing to show that their bilateral relationship is not tied to Ukraine, and that they are looking for opportunities to work together as the situation in Europe allows.